14 football games across four divisions made for a dramatic final day of the Allianz Football League. In Division One, Kerry and Mayo set up a mouthwatering league final clash after beating Roscommon and Monaghan respectively. Galway, who needed a win in Omagh to qualify for the decider, came up short against Tyrone while Dublin bounced back from their league disappointment to relegate Cavan. Roscommon join them in the trip back to Division Two after the Kingdom's win at Dr Hyde Park. In Division Two there was similar drama - at the top, Meath beat Fermanagh to secure promotion to the top flight while they will be joined by Donegal, who thrashed Kildare by 1-20 to 0-10 in Ballyshannon. The Royals will face Declan Bonner's men in the Division Two final in Croke Park next Saturday evening. At the other end of the table there was a very tense finish. Clare secured their Division Two status with a heart-stopping 3-15 to 1-19 victory against Tipperary, relegating the Premier county in the process. 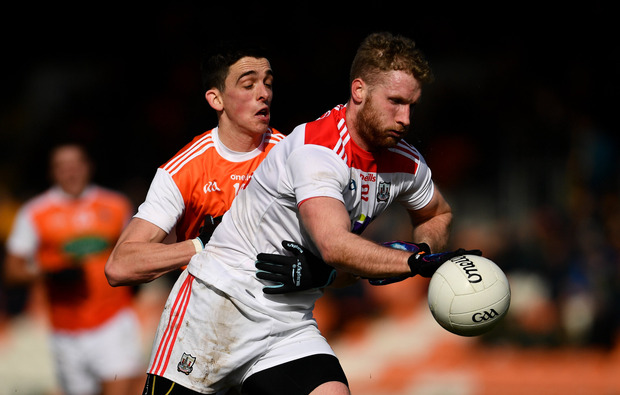 That result meant that Cork also drop down to Division Three despite a 3-9 to 1-14 win in Armagh. In Division Three, Down missed a golden opportunity to secure promotion after slipping up at home to Louth. Down lost 0-10 to 1-6 and will be relying on Louth to do them a favour when they face Westmeath in a rescheduled fixture next weekend. Laois secured their second straight promotion after edging Carlow 1-15 to 1-12, with Turlough O'Brien's men dropping back into Division Four after Offaly secured a 1-11 to 1-10 win against Sligo, who also go down. League finalists: Derry and Leitrim.